In the past few months, the price of Ethereum has fallen drastically again, which has possibly caused great market panic. ETH is one of the most heavily affected coins in the recent cryptocurrency market crash. The current price of Ethereum is $115.41 (at the time of reporting). The EMA line indicates a downward trend and the MACD also shows that prices are struggling with a severe bearish market outlook. Historically, data shows that the prices of Ethereum was less than US$5 in 2016, after which, it was followed by a sharp increase in tandem with the hottest ICO market boom starting from March 2017. In just four months, Ethereum increased at an exponential rate from $15 to $300, doubling every single month. By the end of 2017, the price of ETH exceeded $1,500, which allowed ERC20 token investors to get more than 10 to 100 times return of investments. 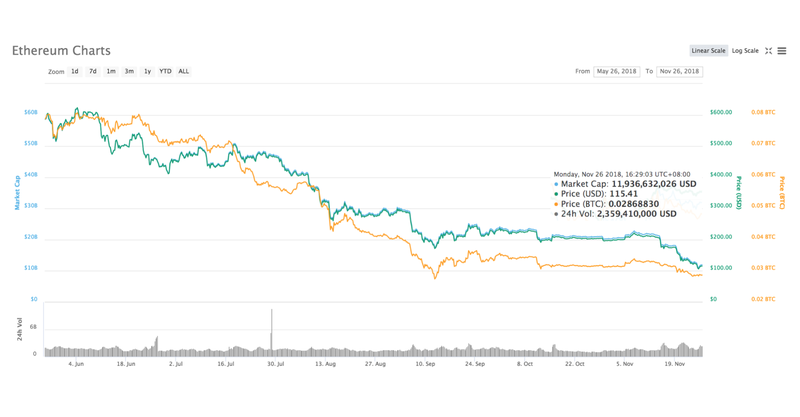 However, in the past few months, the price of ERC20 tokens and Ethereum have fallen sharply. Most analysts attribute the decline in ETH prices to the sell-off of ERC20 blockchain projects. During the ICO market boom, these projects managed to raise millions of dollars in ETH from their token sales. However, during this difficult financial bear market, many ICO projects were forced to liquidate some of their digital tokens. As such, when these ERC20 project sell their Ether, it causes ETH to experience a stronger downward pressure as compared to other major cryptocurrencies. According to historical statistics, as of August 2018, the ERC20 project sold a total of 400 million US dollars of Ethereum. The sale of this large amount of ETH from ERC20 projects have contributed greatly to the downward trend of ETH. Recently, Ethereum founder, Vitalik Buterin, said during a meeting that the digital price change of ETH is only a game between the rich and the development progress of Ethereum has continued to progress unhindered. For example, Google has added the Ethereum blockchain data to its local big data analytics platform, BigQuery, to drive smart contract and ledger analysis, which will lay the foundation for the continued development of ETH. While ETH prices may continue on a downward trend, in the long run, the fundamentals of Ethereum will continue growing stronger, even in the bear market. As such, it will only be a matter of time before it rebounds from its current price.